Forty Five:Is Andrew a True Star Wars Fan? Episode Forty Five: Is Andrew a true Star Wars Fan? We catch up after 3 weeks of not recording. We discuss our respective Thanksgiving plans. If you weren’t sure we were brothers before, you certainly will be sure now. All the Boys are current on “Supergirl” We enjoy it to varying degrees. Christopher confirms his 10 year old daughter loves it. “Marvel’s Jessica Jones” has dropped on Netflix. We all make the commitment to watch the entire season before the next podcast. Andrew is deep into “Nemesis Games”. It has a very different feel than the other “The Expanse” books but that’s not bad. He has stacks and stacks of comic books to read and is ashamed he is so far behind. Both Christopher and Patrick have finished “The Aeronaut’s Windlass” by Jim Butcher. Both agree that the book finishes very strong. Butcher writes a very exciting last third the novel. No one has any idea how many books will be in the series. Andrew plays more “Destiny” He needs to buy an Xbox One. He will play “Star Wars: Battlefront” and “Halo 5”. He needs to do some adult money spending first. Patrick thinks that is lame. Christopher plays “Forza”, “Halo 5” on his Xbox One. And, of course, “Destiny”. Patrick has played “Star Wars: Battlefront” and “Fallout 4” both on PS4 and Xbox One. He wishes “Battlefront” had more story. He cannot tell the difference in the high definition of either console. In “Episode IV: A New Hope“ Luke wants to go into the Toshi Station to pick up what? (in the whiniest voice imaginable). And what is Uncle Owen’s reply? Neither of the Brothers can get both parts. 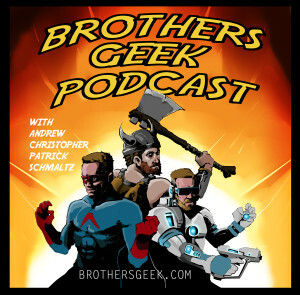 This entry was posted in Podcasts on November 29, 2015 by BrothersGeekadmin.